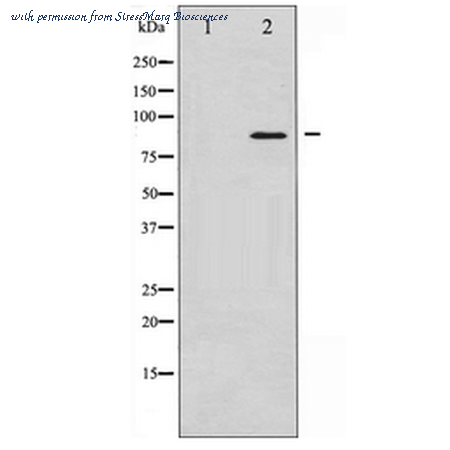 The STAT3 antibody from Proteintech is a rabbit polyclonal antibody to a recombinant protein of human STAT3. This antibody recognizes human,mouse,rat antigen. 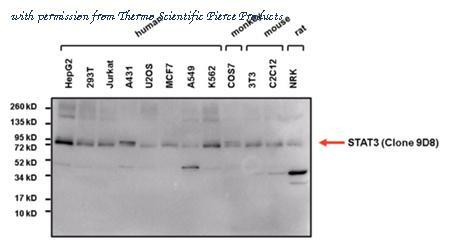 The STAT3 antibody has been validated for the following applications: ELISA, WB, IHC, IF, FC, IP analysis. 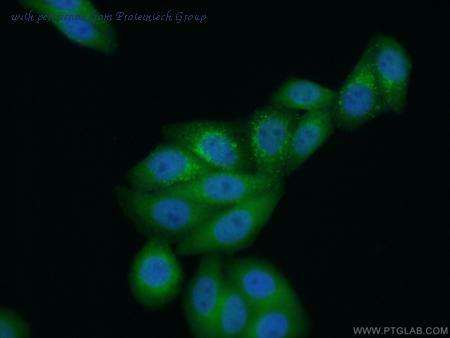 Immunofluorescent analysis of STAT3 using anti-STAT3 (9D8) monoclonal antibody (Product# MA1-13042) (shown in green) in HeLa cells. Formalin fixed cells were permeabilized with 0.1% Triton X-100 in TBS for 10 minutes at room temperature. Cells were then blocked with 1% Blocker BSA (Product #37525) for 15 minutes at room temperature. Cells were probed with a mouse monoclonal antibody recognizing STAT3 (Product# MA1-13042), at a dilution of 1:100 for at least 1 hour at room temperature. Cells were then washed with PBS and incubated with DyLight 488 goat-anti-mouse secondary antibody (Product# 35503) at a dilution of 1:400 for 30 minutes at room temperature. 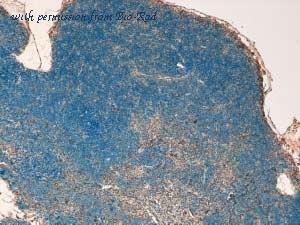 Nuclei (blue) were stained with Hoechst 33342 dye (Product# 62249). Images were taken on a Thermo Scientific ArrayScan at 20X magnification. 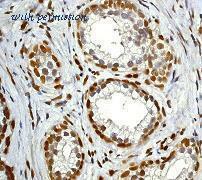 Immunohistochemistry was performed on biopsies of normal and cancer tissues. To expose target proteins heat induced antigen retrieval was performed using 10mM sodium citrate (pH6.0) buffer for 20 minutes at 95°C. Following antigen retrieval tissues were blocked in 10% normal goat serum (Product #31873) for 20 minutes at room temperature. Tissues were then probed at a dilution of 1:1600 with a mouse monoclonal antibody recognizing STAT3 (Product # MA1-13042) overnight at 4°C in a humidified chamber. Detection was performed using a goat anti-mouse HRP secondary antibody followed by colorimetric detection using DAB substrate. Tissues were counterstained with hematoxylin and prepped for mounting. Images were taken at 400X magnification. Results demonstrate both nuclear and cytoplasmic localization of STAT3. Western blot analysis of STAT3 was performed by loading 25ug of various whole cell lysates onto a 4-20% Tris-HCl polyacrylamide gel. Proteins were transferred to a PVDF membrane and blocked with 5% Milk/TBST for at least 1 hour. Membranes were probed with a mouse monoclonal antibody recognizing STAT3 (Product # MA1-13042) at a dilution of 1:5000 overnight at 4°C on a rocking platform. Membranes were washed in TBS-0.1%Tween 20 and probed with a goat anti-mouse-HRP secondary antibody (Product # 32430) at a dilution of 1:20,000 for at least one hour. Membranes were washed and chemiluminescent detection performed using Pierce Super Signal West Dura (Product #34075). 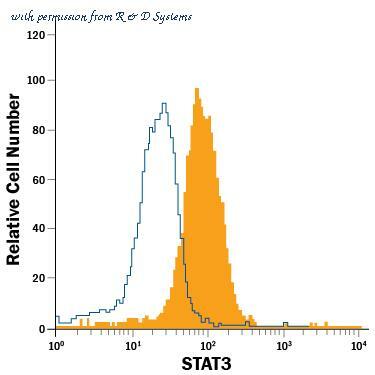 Detection of STAT3 in Jurkat Human Cell Line by Flow Cytometry. Jurkat human acute T cell leukemia cell line was stained with Mouse Anti-Human STAT3 Monoclonal Antibody (Catalog # MAB1799, filled histogram) or isotype control antibody (Catalog # MAB0041, open histogram), followed by Allophycocyanin-conjugated Anti-Mouse IgG F(ab')2 Secondary Antibody (Catalog # F0101B ). 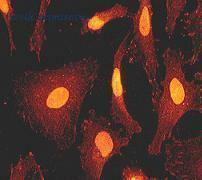 To facilitate intracellular staining, cells were fixed with paraformaldehyde and permeabilized with methanol. Detection of STAT3 in Jurkat Human Cell Line by Flow Cytometry. Jurkat human acute T cell leukemia cell line was stained with Mouse Anti-Human/Mouse/Rat STAT3 Fluorescein-conjugated Monoclonal Antibody (Catalog # IC1799F, filled histogram) or isotype control antibody (Catalog # IC0041F, open histogram). View our protocol for Staining Intracellular Molecules . 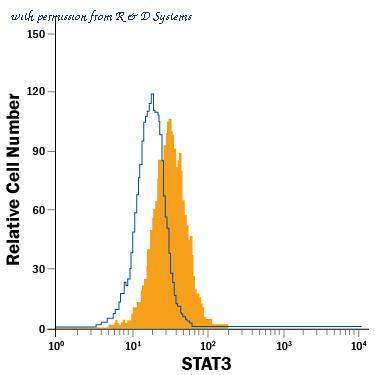 Detection of STAT3 in Jurkat Human Cell Line by Flow Cytometry. 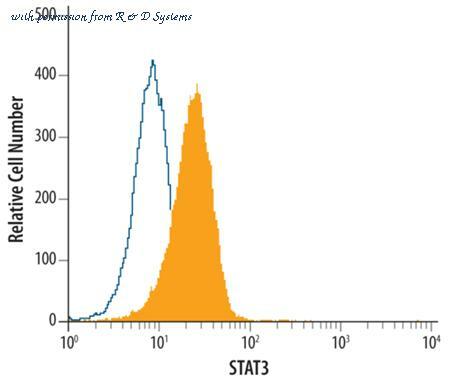 Jurkat human acute T cell leukemia cell line was stained with Mouse Anti-Human/Mouse/Rat STAT3 PE-conjugated Monoclonal Antibody (Catalog # IC1799P, filled histogram) or isotype control antibody (Catalog # IC0041P, open histogram). To facilitate intracellular staining, cells were fixed with Flow Cytometry Fixation Buffer (Catalog # FC004 ) and permeabilized with Flow Cytometry Permeabilization/Wash Buffer I (Catalog # FC005 ). View our protocol for Staining Intracellular Molecules . 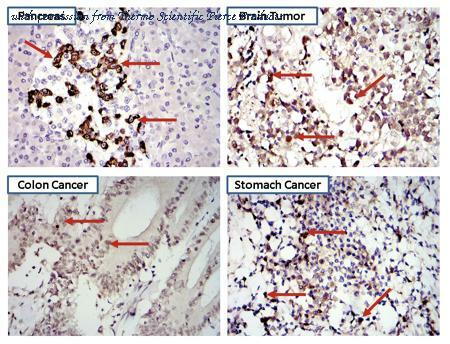 B. Immunohistochemical analysis of paraffin-embedded human colon adenocarcinoma using anti-Phospho STAT3 (pY705) RabMAb (cat. # GTX61820). A. Western blot analysis on HeLa cell lysates using anti-Phospho-Stat3 (pY705) RabMAb (cat. #GTX61820) 1:20000 dilution. Cells were either (A) untreated (B) treated with IFN-alpha. Western blot analysis of untreated (1), EGF stimulated (2), or pervanadate treated (3) A431 cell lysates with Stat3 (pSer727) mAb, clone 23G5. 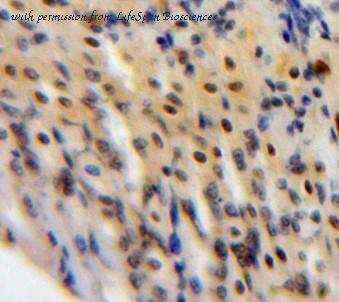 Immunohistochemistry analysis of human lung cancer tissue with Stat3 (pSer727) mAb, clone 23G5. Western blot analysis of Stat3 Lane 1: MW, Lane 2: A431, Lane 3:HeLa, Lane 4: NIH-3T3. Western Blot: STAT3 [p Tyr705] Antibody [NBP2-24463] - Analysis of STAT3 (Tyr705) in recombinant fusion protein containing 1) a phosphorylated tyrosine at position 705 and 2) an unphosphorylated tyrosine at position 705, using STAT3 phospho antibody at 0.1 ug/ml. Goat anti-rabbit Ig HRP secondary antibody and PicoTect ECL substrate solution were used for this test. Western Blot: STAT3 Antibody (9D8) [NBP2-22471] - Human breast cancer cell MDA-MB-231 was treated with carboplatin for 72 hours and the expression of p-Stat3 at Y705 and total Stat3 were detected by western blot. From verified customer review. 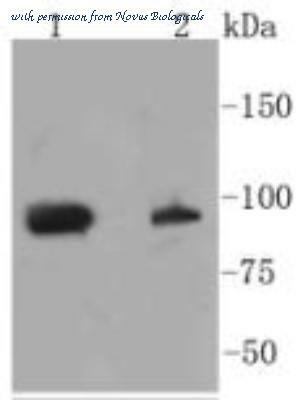 Western blot analysis of Human K562 cell lysates showing detection of ~86kDa STAT3 protein using Rabbit Anti-STAT3 Polyclonal Antibody (SPC-1334). Lane 1: Human K562 whole cell lysates treated with the immunizing peptide. Lane 2: Human K562 whole cell lysates. 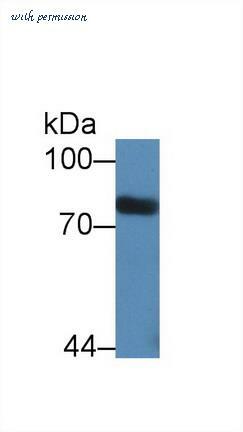 Primary Antibody: Rabbit Anti-STAT3 Polyclonal Antibody (SPC-1334) at 1:1000. Predicted/Observed Size: ~86kDa. 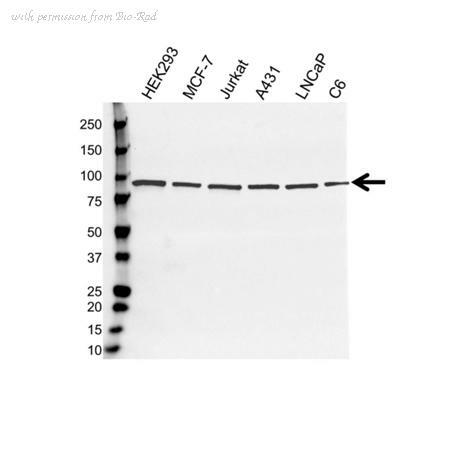 Western blot analysis of Human Cervical cancer cell line (HeLa) lysate showing detection of ~88 kDa STAT3 (pSer727) protein using Rabbit Anti-STAT3 (pSer727) Polyclonal Antibody (SPC-1431). 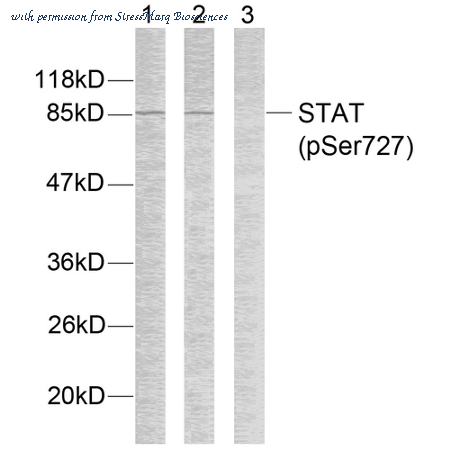 Lane 1: STAT3 Antibody (pSer727). Lane 2: STAT3 Antibody (pSer727) preincubated with synthesized non-phospho-peptide. 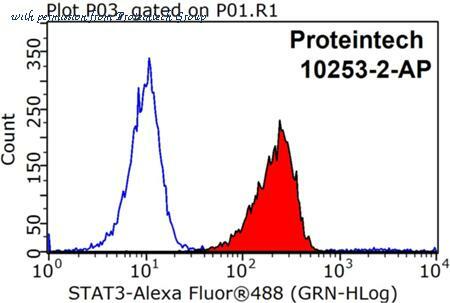 Lane 3: STAT3 Antibody (pSer727) preincubated with synthesized immunizing phosphopeptide. Load: 10 µg. 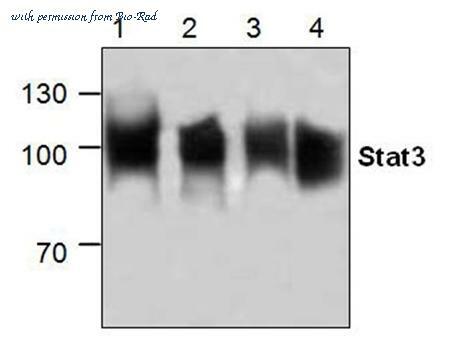 Primary Antibody: Rabbit Anti-STAT3 (pSer727) Polyclonal Antibody (SPC-1431) at 1:1000. Predicted/Observed Size: ~88 kDa.